This important article on employee-owned companies and how a brand influences behavior is written by John Case, originally posted on his website, Employee-Owned America, and we are sharing it here with his permission. Most employee ownership advocates have had the experience. You mention the topic in casual conversation. You elicit some interest, but it’s followed by a confession of ignorance—something like, “I had no idea there were so many companies owned by their employees.” So one task we face is simply spreading awareness. As most people in the field know, Certified EO is attacking this challenge by harnessing the power of branding. Companies who sign up with the organization and meet the requirements can use the “Certified Employee-Owned” or “100% Employee-Owned” badge on their packaging and promotional materials. It’s a lot like the “organic” or “non-GMO” icons that many consumers seek out on food items—or the “Great Place to Work” certification that job seekers often keep an eye out for. 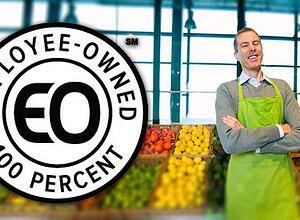 Certified EO recently passed the 50-members milestone, a roster that includes large, well-known employee-ownership companies such as Winco Foods (Boise, Idaho) as well as smaller outfits such as Mountain Hardware and Sports (Truckee, California). Like any good marketer, the organization has been conducting surveys and gathering statistics that define a baseline. What are consumers’ current reactions to the EO brand, compared to their reaction to similar brands? What about job seekers? The organization recently released some updated numbers reflecting its latest surveys and statistical analyses. Job seekers. Survey respondents were asked to rate on a 1-to-5 scale whether they would be more or less likely to apply to a certified or 100% employee-owned company if they were looking for a job. They were asked the same question about other certifications, including those from Glassdoor (“Best Places to Work”), the Great Place to Work Institute, or the Top Workplaces organization. The researchers tallied the “more likely to apply” responses and then calculated the net effect, meaning those who were more likely minus those who were less likely. Analysis of the data showed little variation by age, gender, or rural vs. urban regions. It did show that higher-income respondents were significantly more likely to respond positively to the EO certifications. Analysis of the demographics revealed a similar skew toward favorability from higher-income respondents, plus modest skews in the same direction from older people, rural residents, and men. The conclusion? “The Certified Employee-Owned mark is already influential with both job seekers and consumers,” says Thomas Dudley, the organization’s chief executive. “There’s a big net positive in every demographic group.” Dudley says that “employee-owned” is far more powerful than “ESOP,” which some EO companies have used to distinguish themselves. He adds that this is just a starting point: there’s a long ways to go in building the kind of awareness that’s needed. But at least we know where we’re starting from. These numbers intimate how important branding is on many levels, for varying aspects of our lives. Clearly, people seek out what resonates with their personal values for many important everyday decisions. Choosing to do business (or not) with your company is not relegated solely to a business mindset for most. Are your company values via your brand and brand promise easily recognizable and clear to people? Will visitors to your website understand the central essence of your brand from you home page? Not sure? See how distinguishable your brand is with our brand report card. Is your brand communicating what you intend it to? John Case is a veteran journalist, a former senior writer at Inc. magazine, and author or coauthor of numerous books on business and economics. With Corey Rosen and Martin Staubus, he wrote the pathbreaking book Equity: Why Employee Ownership Is Good for Business, published by Harvard Business School Press. His articles have appeared in Inc., Harvard Business Review, the Atlantic, and many other publications.